Posted September 22, 2014 by admin & filed under White Bear Lake Auto Repair. One of the most frustrating car problems is when you turn the key and nothing happens — but we’re here for you! Our auto experts in White Bear Lake can help diagnose the problem to get you back on the road. If your battery is dead, you’ll need to jump start your car. Keep your car running for at least 20 minutes to allow the battery to build its charge. If the jump start doesn’t work, you might have bigger problems – give us a call at 651-426-0462.
multimeter (if you have one). 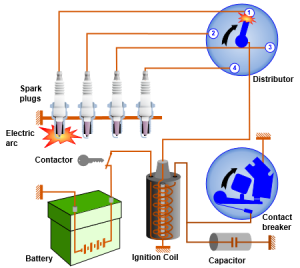 If your vehicle’s ignition system can’t spark, your engine won’t start.